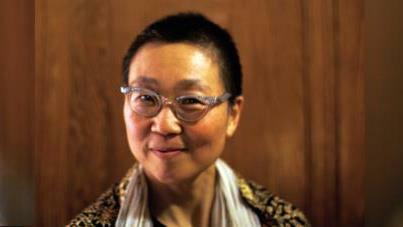 Gwi-Seok (Peggy) teaches Iyengar Yoga as a creative art form, a meditation, and a healing justice practice for ourselves and our communities. She lives in Detroit, Michigan, where she teaches beginning through advanced students, primarily at Iyengar Yoga Detroit. Certified in 2018 at the Intermediate Senior I level by IYNAUS, she also teaches prenatal and postnatal yoga, students with chronic issues and injuries, and mentors developing teachers. Practicing Iyengar Yoga since 1996 and teaching since 2001, she is honored to teach regionally, nationally, and internationally. She pays great debt and homage to her teachers, Laurie Blakeney, Lois Steinberg, the Iyengar family in Pune, India, and many Senior Teachers in the USA and India. Also a poet, dancer, and music-maker, she is committed to making the sacred art of Iyengar Yoga accessible to all. Her poems and essays can be read at Still in Sirsasana.